As we head toward the end of the calendar year, two opportunities are available that have importance and lasting impact on our school. Certainly, everyone who pays tuition appreciates the various school tuition organizations (STO’s) that are active in the state of Arizona. Many of our families benefit from tax credits through local and state STO’s, including the Institute for Better Education (IBE) through which tax-credit dollars can be directed on behalf of specific students. For a number of years, St. Michael’s has promoted the importance of support for the Arizona Episcopal School Foundation (AESF) as a recipient of tax-credit dollars from our families. AESF is the major source for our school financial aid, which is awarded to financially qualified families. Through AESF, St. Michael’s has been able to assist many families in sending their children to St. Michael’s, and we hope that we will be able to continue that practice through the strong support from our families for AESF. There are many positive benefits that result from the Arizona tax credits, and we are grateful for those who designate tax credits for St. Michael’s through AESF. In addition to tax credits, support for our school’s Annual Halo Fund through tax-deductible contributions helps to sustain the St. Michael’s operating budget and offsets the difference between tuition dollars received and the cost of operating the school. St. Michael’s has a long history of operating in a fiscally conservative manner in order to keep our tuition at an affordable level. In doing so, however, we depend on the generosity of our families and friends, including members of the church community, through donations to our Annual Halo Fund. This year, our goal is to raise the level of participation from our families. 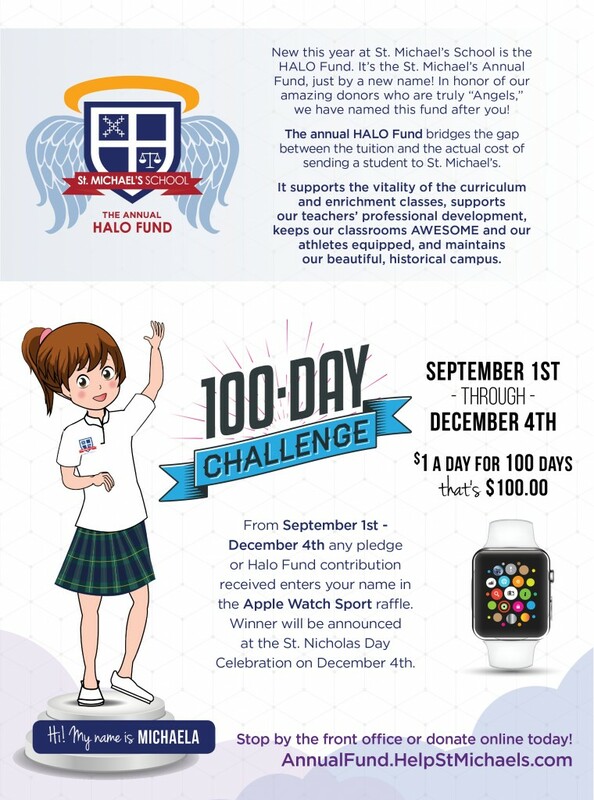 As a small incentive, those who have made a donation by Friday, December 4, will be entered in the drawing for an Apple iWatch, which will take place at the St. Nicholas Day program. All donations, big or small, are gratefully appreciated and make a difference for our school. I hope that if you have not yet made a pledge or donation, you will consider doing so before December 4. Pledges may be made at any time and paid by June 30, 2016. Thank you for joining me in participating in the Annual Halo Fund and for your support of the Arizona Episcopal School Foundation with your tax-credit dollars. We are blessed by the generosity of many who make it possible for us in turn to help our students. For that I am truly thankful this season. Don’t Miss Out on Your Chance for an Apple Watch! Have you made your donation to the Annual Fund yet? Please take the time to do that today and join the number of families who have made their donation. The size of the gift is not as important as participation. Donations to the Annual Fund, which are tax deductible, are a vital part of our school operation, helping to close the gap between tuition dollars raised and the total cost of operation. We strongly encourage all families to participate at the level they are able. Generous tax-deductible donations to our Annual Fund allow us to keep our tuition at a reasonable level. Thank you for your support and your generosity. Donations and pledges to the Annual Fund should be paid by June 30, 2015. It’s that time of the year. Mailboxes become full of all kinds of advertisements and pleas aimed at getting our attention, our votes, and our pledges of commitment. Understanding that, I wanted to say a few things about the St. Michael’s Annual Fund and the information that will soon arrive in your mailbox from our school. Many people wonder what the purpose of this annual request is and what part each of us plays in the success of the campaign. Each of our families holds the key to our success, and your participation is essential. So what is the Annual Fund, and what is it for anyway? As an Episcopal school, by design we are financially independent from our parish church. Our primary source of revenue comes from tuition dollars. St. Michael’s has always been committed to tuition levels that remain affordable to current and prospective families. In doing so, however, there is a gap between money that comes from tuition and the cost of operating the school. This gap is generally closed through monies raised from tax-deductible donations made to the Annual Fund. There is no level of expectation as to the size of the donation. Families donate as they are able. Every single gift makes a difference, and our goal, though lofty, is to have 100 percent participation by our families at St. Michael’s. When your packet arrives in the mail, please give serious thought to the gift that you can make to St. Michael’s. At the same time, as you read through the annual newsletter, The Eagle, I think you will feel the same sense of pride that I experience as I reflect on the wonderful program we have to benefit the children. I am happy to support St. Michael’s through the Annual Fund, giving back to a school that has given me so much. I hope that you will join me this year in making your donation to the Annual Fund. You are the key to our success, and, together, we are making a difference for the students of St. Michael’s. Thank you in advance for helping us to reach our goal. I continue to feel deep gratitude for the generosity shown by this community. The year is winding down so fast that my head is spinning! There is so much yet to do and so little time. As minds turn to summer and plans are being made, I wanted to take this opportunity to say “thank you” to everyone who has supported the Annual Fund this year with a donation. In addition, those who directed their tax dollars to the Arizona Episcopal Schools Foundation have truly made a difference in assisting many students to attend St. Michael’s. There is always confusion about the Annual Fund and how it differs from tax credits. The Annual Fund is a tax deductible contribution to the school. Tax credits are not a donation to the school; it is simply directing your tax dollars for a specific purpose. Our Annual Fund is critically important to our school. Every effort is made to keep our tuition at an affordable level, but tuition alone is not enough to run the school. Since St. Michael’s, by design, does not receive any funding from the church, our two main sources of revenue for operating the school are tuition dollars and contributions to the Annual Fund. The Annual Fund is built into our budget, and therefore, we depend on all of our families to contribute to the Annual Fund as they are able. Every donation, regardless of the size, makes a difference. Currently less than 35% of our families have made contributions to the Annual Fund this year. Could you help us reach the 50% mark? Donations to the Annual Fund can be made to St. Michael’s up until June 30, 2014. If you haven’t already made your donation, please consider supporting this essential piece of our school operation. You can make a difference in the life of our school and help us to continue to provide the best educational experience for our students. I have made my donation. Have you? Recently, you should have received a beautiful packet from St. Michael’s describing our Annual Fund campaign. I hope that you were able to take a few moments to read through the information which described very concisely why this is so important to the school. So the question then comes up, “I pay tuition, so why should I give to the Annual Fund?” The answer can be complex, but let’s keep it simple. St. Michael’s works very hard to keep our tuition at an affordable level. However, our operational costs exceed the amount we receive in tuition. Rather than raise tuition to fill that gap, we rely on the generosity of our school community to help make up that difference through a gift to the Annual Fund. Just about every independent school has a similar program. You see, tuition payments are not tax deductible. Gifts to the Annual Fund are tax deductible. The next question that follows is, “How is this different from tax credits?” The state of Arizona allows you to direct a portion of your tax liability to educational institutions. Gifts directed to St. Michael’s through tax credits are given to the Arizona Episcopal Schools Foundation. These directed tax dollars benefit our scholarship program and can only be used for that purpose. While tax credit dollars are very important in assisting a wide range of qualified students attend St. Michael’s, tax credit dollars are not part of our Annual Fund. This year, my hope is that a much higher percentage of our families will support the Annual Fund with a tax deductible gift to St. Michael’s. Your generosity, regardless of the size of your gift, is deeply appreciated and does make a difference. At the end of the day, it’s about the children and our desire to always provide the very best educational program for them that we can. Your gift is an essential piece in accomplishing that goal. My pledge is in…is yours?